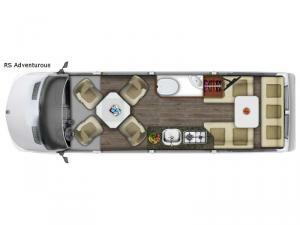 For the RVer with discerning taste, this Roadtrek RS Adventurous class B diesel is for you! Come discover all of your travel possibilities when you choose your very own RS Adventurous diesel coach. A spacious interior provides dining and sleeping space for four, and allows room enough for seven travelers to ride safely seated in the four plush captain seats up front and three more in back. The open layout is roomy, yet small enough for you to be comfortable driving and parking in regular spaces. On the outside, you will appreciate the clean lines and a stylish finish to the open concept interior featuring up to 91 cu. ft. of storage and breathtaking views through large frameless windows. Enhanced safety features like blind spot monitoring, as well as lane keeping and high beam assist make owning and driving this RS Adventurous a dream come true! You will enjoy all of the conveniences on the inside with the expanded galley featuring a convection microwave oven, as well as the spacious permanent bathroom featuring a stand-up or sit-down shower, plus so much more!